How to get there: A good starting point is the tiny village Spiliá. This village is located at about 800 meter elevation, 10 kilometers from the village Sikoúri. Locate this on a map NE of the large town Lárissa. Lárissa is on Hwy. E-75, between Athens and Thessalonika. There is a road directly from Lárissa to Spiliá. If coming from the south (Athens) on Hwy. E-75, take the 3rd. Lárissa exit and go right. If coming from the north on E-75, one can also drive via the village Elátia. I stayed in a small motel and had a good dinner right next to the main square in Spiliá the precise location being N39:47.818, E022:38.791, with an elevation of 816 meter. Pay for the room in the evening, I made a mistake of not doing this and had a delay the next morning, since nobody seemed to wake up before 0900. One may as well walk from the village center, I drove to the upper end of the village and parked at N39:47.705, E022:39.062, elevation 853 meter. 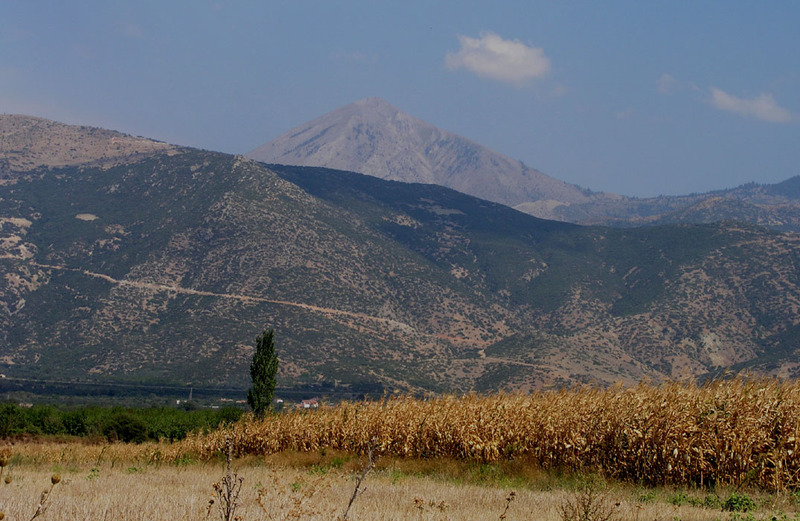 Route description: From the upper end of the village, ascend a small plateau from the location given above and cross it keeping a direction towards the valley between Kissavos and the terrain to your right. The canyon coming up on your left is not very deep this far up and there is a distinct trail descending into it just right of some rather steep cliffs. Once in the canyon, ascend the other side keeping right when natural, then head uphill on the lower slopes of Kissavos. You will cross an old road fairly soon. The route (there is no trail going up here) is now generally up the slope. I stayed pretty close to the fairly distinct ridge (west ridge) when ascending, while I followed a slightly gentler slope a bit further north on descent. The terrain is full of loose rocks, but still fairly ok for hiking. 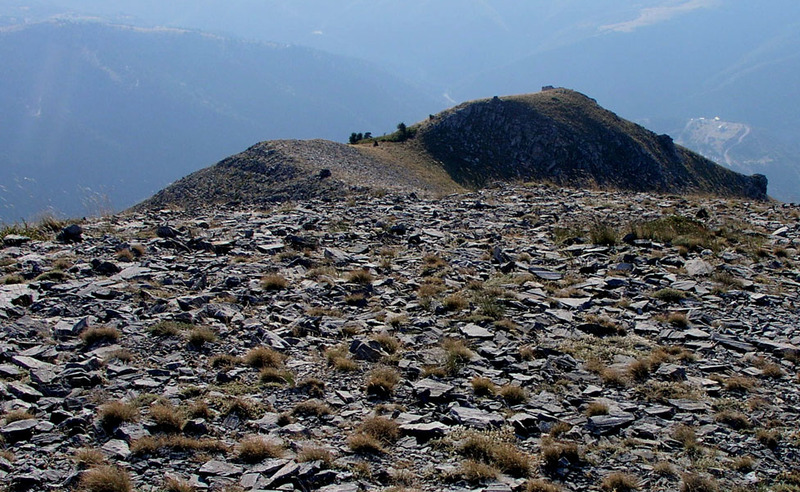 Higher up, the ridge becomes more distinct and also easier to walk on. Near the top, the ridge curves towards your right, stay on top and continue to the summit. There is a white marker, a large bell and a small flagpole at the summit. Note: From the summit, I observed a winding road that climbs the mountain further north. It looked like this road serves some antennas located quite high, but not on the summit. An alternate route is therefore to descend a little north from Spiliá cross the canyon and follow this road. To drive this road (if it is open) would not constitute a proper climb of the mountain. 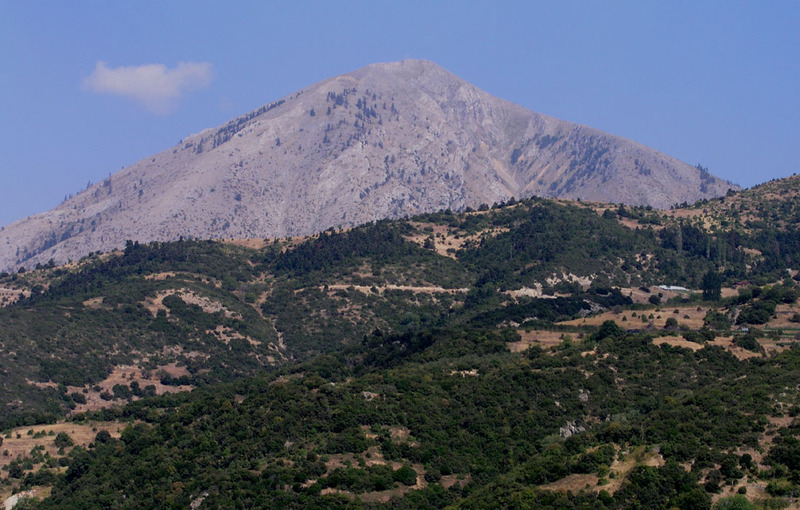 Comments: I had already climbed the highest point in Greece, Mytikas on Olympos, this morning before heading over to explore the prominent peak of Kissavos. After checking into a small motel in Spiliá I decided there was time for climbing the peak in the beautiful afternoon sunshine. I started from my car at 1600, reached the summit at 1805, rested 10 minutes and returned to the car at 1930 just before sunset. With a vertical gain of 1128 meter, the total vertical for the day exceeded 3000 meter, quite a start on my first full day in Greece. The village Spiliá turned out to be "the little unspoiled village that has not seen a tourist for months", you have to ask to find accommodation, no signs. My "motel room" turned out to be an apartment with livingroom, kitchen and a large bedroom. I had dinner in the nearby restaurant, very good grilled meat with a salad, plus two large beers for 7 Euro! Only local people besides me, they obviously all knew each other. About 10 senior men from the village were playing cards, great entertainment. It seemed that the most important thing was not to win the game, but to slam the card onto the table with force, authority, making the proper arm swing and sound etc. They all tried to outdo each other in this, displaying skills that clearly had come with playing essentially the same game every day for many, many years. My Greek trip continued (the next day) with a climb of Liakoura. 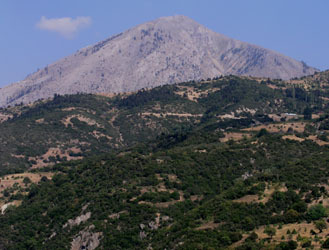 Kissavos, as seen from the north. Kissavos, as seen from the west. Kissavos, a closer look from the west. 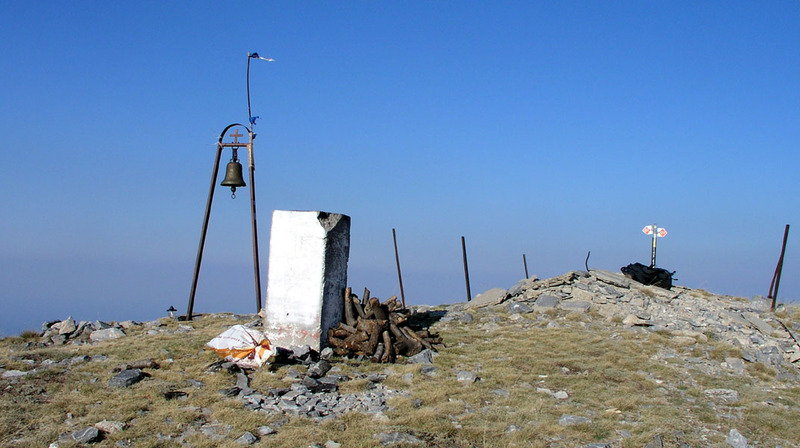 The Kissavos summit, a bell and various other markers. View north from the summit to the coast. The final summit ridge approach from the west side. Looking down the west ridge. It is a bit steeper than it looks. 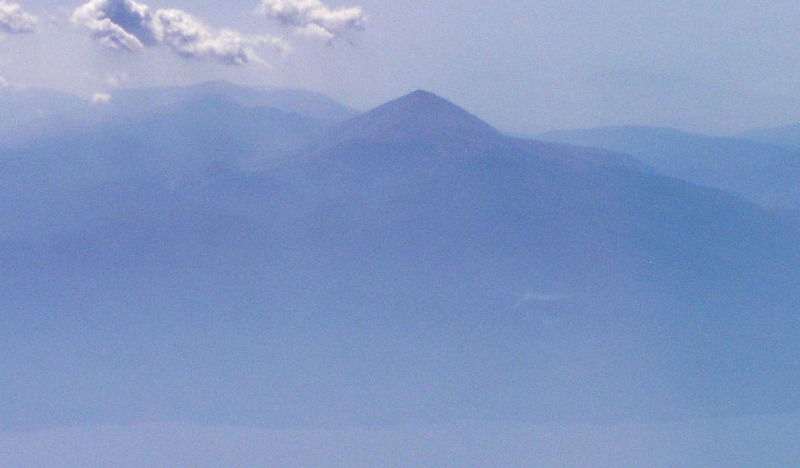 Kissavos, as seen from the air looking west towards the coast. 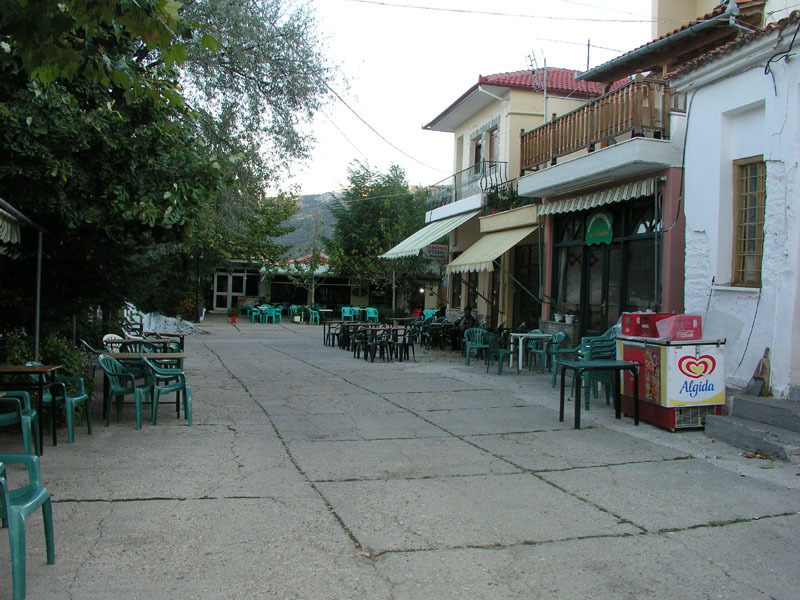 The village Spiliá, few tourists.